The fortune in the cookie with tonight’s take-out ginger beef reads, “An interesting sports opportunity is in your future.” And yet, tonight’s post-ginger beef activity is to review two La Parfumerie Moderne fragrances, one of which is called No Sport. I’ll go with the perfume for now and hope that my near future doesn’t come with athletic gear. Marc-Antoine Corticchiato, the nose behind Parfum d’Empire, developed both No Sport and Cuir X. No Sport was named for Winston Churchill’s supposed reply when asked the secret of a long life. “No sports,” he said, “just whisky and cigars.”1 No Sport’s notes include bergamot, galbanum, rose, geranium, clove, tonka bean, sandalwood, hay, almond and tobacco. No Sport is a sheer rose and geranium fragrance with handfuls of golden hay with the refreshing, sparkling, yet substantial feel of a whisky and soda with a fat twist of lemon. When I read “tobacco” in a fragrance’s notes, I think of thick, woody tobaccos like Tom Ford Tobacco Oud, but No Sport’s tobacco is watery and cool with a hint of pencil shavings. The fragrance’s mood is fresh, but it carries with it the civilized feel of a study with a vase of full-blown roses on the desk and the window open to an August afternoon. In mood — not smell — No Sport reminds me of Hermès Equipage. It lasts all day, although close to the skin. Cuir X is the sensual, whipped cream and velvet answer to No Sport’s lighthearted, youngest-son-of-a-duke vibe. Cuir X’s notes include mandarin, elemi, jasmine, iris, saffron, tonka bean, vanilla, styrax and labdanum. As leathers go, it’s the supple and sweet kind rather than the oily or salty type, and it’s thick with iris and green-stemmed flowers, and softened with the skin-like, medicinal hit of saffron. I’d sure love a wallet made out of leather like this. If you’re familiar with another of Corticchiato’s leather fragrances, Parfum d’Empire Cuir Ottoman, you might wonder how they compare. To me, they’re siblings in that they’re both smooth and pillowy and sweet, but Cuir X’s floral spine sets it apart from Cuir Ottoman’s tinge of incense. For a rich, comforting leather, either one is a nice choice, and if you were considering buying one, I'd recommend trying the other, too, before you make your decision. Cuir X, like so many leathers (on me, at least), fades after four hours or so, despite its lush sillage. La Parfumerie Moderne No Sport and Cuir X Eaux de Parfum are each $220 for 100 ml. Try Jovoy Paris in France; Barneys or Twisted Lily in the US. 1. I can’t find any source for the quote, although Churchill didn’t seem to be much of an athlete. He told a journalist that most of his exercise came from being a pallbearer at the funerals of friends who exercised. Thanks for the reminder of Churchill’s wit! Tried a sample of Desarmant, and didn’t fall for it, though I thought I might. Do you think Cuir X bears any resemblance to Cuir de Lancome? Perhaps this one’s a bit greener. 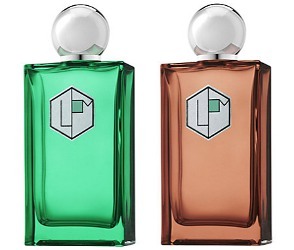 It’s funny you mention it, because I did think of Cuir de Lancome when I sampled Cuir X. I didn’t try them side by side, and I used up my Cuir X sample (couldn’t resist), so I can’t give you a definitive answer. But, yes, one perfume does bring to mind the other for me. What wonderful quips from Churchill! And it sounds like No Sport ought to be my signature scent in every way. Sounds like my mum channels WC: she is vehemently anti-exercise and plans to outlive everyone by taking it easy. She once read aloud the obituary of a former neighbor, adding, “and HE was a jogger”. Hi Angela, glad to see you put your hands on Cuir X. Told you it’s very similar to Cuir Ottoman, didn’t I? Thank you for reviewing those, I have been wanting to try those for a long time! No Sport sounds right up my alley, except that it sounds masculine- leaning. I guess I need to get the sample set. I didn’t find No Sport to be too masculine, despite the kick of geranium. I’d be comfortable wearing it. It’s an untraditional sort of fragrance, though, so it’s a good one to sample to see what you think. The sample set is a great idea. I’m definitely interested in Cuir X. I love Cuir Ottoman and have considered a bottle, and now I think I need to compare. That’s what I’d do if I were in your shoes. They’re both lush and comforting! Both of these sound good. I like geranium and No Sport sounds like my motto. I hate any kind of program or retreat which includes what I call compulsory sports. I wonder if the young man was trying to end a sentence in a preposition? I think it means the opposite; the young man was trying to prevent Churchill from ignorantly ending a sentence in a preposition, and Churchill gave him reason to understand why that rule wasn’t always better, especially when spoken. I love it! Even better! These both sound interesting, and I love Cortaccho’s Cuir Ottoman and Tabac Tabou, so I’m keen to try them. No Sport would be nice year round, but we’re definitely getting into Cuir Ottoman / Tabac Tabou weather! I understand! Turn my wallet sideways, and it disappears.